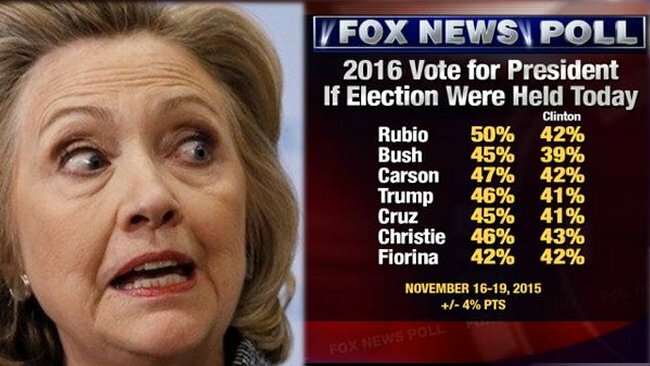 Update 1/9/2016: The latest Fox News poll from the first week in January shows Hillary Clinton still trailing Donald Trump, Ted Cruz and Marco Rubio in head-to-head matchups. However, she has drawn even with Jeb Bush — though the same poll showed Bush garnering only 4% support from Republicans. For much of 2015, the political questions concerning former Secretary of State Hillary Clinton have been whether or not she can hold the lead. She entered the year the clear favorite to win the Democratic nomination. She was, in fact, the most dominant front runner since, well, Hillary Clinton eight years ago. And that’s what made some of her supporters nervous. She never should have lost that lead to then-Senator Barack Obama. But she did. Clinton appears to have learned from that experience. Despite a shaky start to the formal campaign and the self-induced email debacle, she has held onto her dominant lead all year. Next summer, Clinton is almost certain to become the first woman ever nominated for president by a major political party. That perspective may sound crazy to Clinton supporters and many in the DC media club. They see the Democratic front runner as obviously experienced and qualified in contrast to the leading GOP candidates. But fundamentals drive elections more than candidates do. The most important measure of the political climate is the president’s job approval rating. At the moment, President Obama’s ratings are in the low-to-mid 40s. That’s a danger ground, suggesting that he will be a drag on his party’s nominee. At the moment, it’s a problem for Clinton rather than a crisis. But if the president’s ratings go much lower, it will become extraordinarily difficult for the Democrats to retain the White House. On top of that, consumer confidence has just fallen to its lowest level in over a year. An index of manufacturing sentiment is now at the lowest level in more than two years. The country may not be in a recession, but the economic recovery is anemic. And then there’s the foreign policy disarray in the wake of the Paris attacks. Foreign policy generally has only a modest impact on elections, and 2016 is not likely to be any different. However, to the degree that national security becomes an issue at all, it’s a double whammy for Clinton. First, because voters tend to trust Republicans more than Democrats on national security issues. Second, because any national security claims will turn Clinton’s experience as Secretary of State from a positive to a negative. Finally, Clinton’s very success at clearing the Democratic field is likely to haunt her general election campaign. Senator Bernie Sanders and Governor Martin O’Malley are not really pushing her the way she pushed Barack Obama eight years ago. Obama became a much better debater and candidate because of Clinton. The current president also gained stature merely by defeating her. Clinton will enjoy no such advantage. Obviously, there is a lot of time before Election Day in Nov. 2016. Anything could happen. It’s possible that the GOP could self-destruct and split in two, or that Donald Trump could run as an independent candidate. But barring such a lucky break, Hillary Clinton will likely begin her fall campaign as an underdog. Scott W. Rasmussen is an American political analyst, digital media entrepreneur, author, speaker, and public opinion pollster. He is the author of The People’s Money: How Voters Will Balance the Budget and Eliminate the Federal Debt .